Successfully diagnosing and preventing the spread of gum disease. Supportive care from your gum specialists in San Francisco. At SF Perio & Implants, we know that periodontal treatment is an ongoing concern and requires a personalized maintenance program. This custom-made program is developed by Dr. Pasquinelli or Dr. Olivares with your help and is designed to keep periodontal disease under control. Through periodontal maintenance, our experts can keep the disease at bay and promote healthier gum tissue and protect the bones that support your teeth. You also play a vital role in the success of a maintenance program by adhering to a solid at-home hygiene routine. During your regular visits, your San Francisco periodontist provides helpful advice and an evaluation of your routine. By working side by side with us, you are able to benefit from our wealth of knowledge to keep your smile healthy. Your dentist and Drs. Pasquinelli and Olivares work together as a team to provide you with the best possible care. They keep each other informed about your progress but your general dentist is primarily responsible for your overall dental health. Over 30,000 people are affected each year. It's vital to get checked! You may be suffering from the early stages of oral cancer and not be aware of it. It’s common for there to be no symptoms as cancer begins forming in the lip or mouth tissue, on the tongue, in the gums, or even the throat. 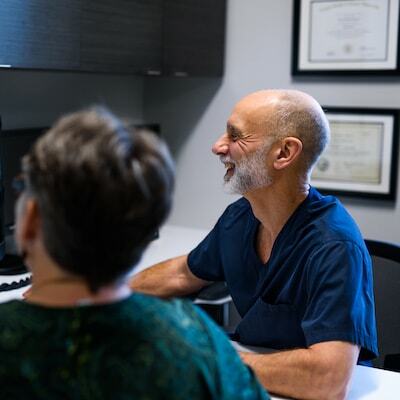 The good news is Dr. Pasquinelli and Dr. Olivares use the latest technology to diagnose oral cancer in its earliest forms. This is a major reason why our experts recommend annual oral cancer exams. If caught early, this disease can be effectively and efficiently treated. However, there may be some symptoms you experience that you can assess at home. These include red or white patches in your mouth, abnormal lesions or lumps, and pain or bleeding. If any traces of oral cancer are evident then our skilled dentists in San Francisco will create a personalized treatment plan for you. Kirk is one of the premier Periodontists in the world. He is second to none. Make your smile sparkle again. A dental “prophylaxis” is a cleaning treatment performed to thoroughly cleanse your teeth and gums. This helps stop the progression of gingivitis and more severe periodontal disease. During your regular exam, your dental hygienist may recommend professional teeth cleaning. Your day-to-day eating and drinking habits can lead to plaque build-up on your teeth and around the gums. So, this cleaning may still be necessary despite a solid brushing and flossing routine. Plaque is a primary cause of periodontal disease, which can lead to complications such as bad breath and tooth sensitivity. These issues are easily and comfortably prevented by your dental hygienist with the help of a thorough cleaning. Stains on your teeth can also be removed, leaving you with a healthier looking smile. Cleanings should be scheduled every six months or more regularly (as prescribed) for periodontal disease sufferers. It is important to note that this treatment is not a cure but rather a prevention or maintenance solution. Although your general dentist may offer professional cleaning, it could be beneficial to see our periodontists as they are more familiar with the issues associated with gum disease. Let’s keep your gums and teeth healthy – together!